These are images of the most popular tourist sites in Vietnam’s capital city. The 2,600m2 theatre was designed by two French architects Harlay and Broyer. The construction took place from 1901 to 1911. It’s a phenomenal piece of neo-classical French architecture featuring Gothic themes on the doors and domes with pillars, shuttered windows, balconies and a glass room. There are 3 main parts in this building: the lobby, the main audience room and the mirror room. The main lobby is the first place welcome visitors enter the theatre. It was made with high-quality stone of Italy. All small chandeliers are brass and look luxurious. Inside the opera house are a large stage and a main audience room with a size of 24x24m, with many small rooms for audiences on the central floor. At the back of the Opera House is a management chamber consisting of 18 make-up rooms, two rooms for voice training, a library and a meeting room. The Main Audience is paved with high quality tiles and fireproof carpet. Seats are designed in classical French style of the nineteenth century. The mirror room is the ritual room that has welcomed many high-ranking officials. 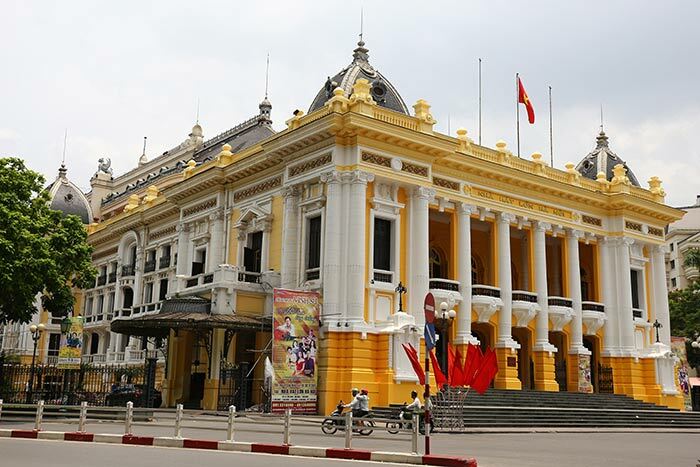 The Hanoi Opera House is the biggest theatre in Vietnam and speaks volumes as historical and cultural evidence of Vietnam under French rule. The interior is even more magnificent than the exterior with many arguing it is aesthetically even more appealing than the Paris Opera House. Visitors today will be entertained at this architectural landmark which features a range of events including local Vietnamese opera, traditional folk music, ballets and many international concerts. Following the end of the August Revolution in 1945, The Hanoi Opera House reverted from entertaining the French elite to becoming the centre of major historical events including the first session of the National Assembly of the Republic. The Hanoi building went into a state of decline prior to being renovated and brought up to date in 1997, which included the installation of state-of-the-art equipment and renewal of some of the interior decorations. Saint Joseph Cathedral, located at 40 Nha Chung Street, Hanoi, is a Roman Catholic cathedral with neo-gothic style, which was built about 120 years ago. In 1882, after the French army conquered Hanoi, the cathedral was constructed and completed in 1886. The cathedral and Nha Chung area were built on land formerly belonging to Bao Thien pagoda, which was built under the Ly dynasty. The architecture with domes of the cathedral follows the Gothic style and design of Paris Cathedral. It is 64.5m in length, 20.5m in width with two bell towers of 31.5m-height. Though the appearance of the cathedral, from the doors, the colorful window glass, to the religious paintings, it follows Western style, and the main interior part is decorated in Vietnamese way with two typical colors yellow and red. Outside, in front of the cathedral is the statue of Mother Maria. The first Christmas event took place in the cathedral in 1887. Since then, the cathedral is always crowded with hundreds of people including both Christians and non-Christians at the weekend or during religious holidays like Christmas. Today, taking advantage of beautiful architecture and a good venue at the center of the city, the area surrounding the cathedral is always packed with hundreds of local people and tourists hanging out with friends for drinking, talking, and watching the street. Nha Chung Street is known as the “Lemon Tea” street, a popular gathering place for many youngsters in Hanoi, and home to eye-catching souvenir shops and Western style restaurants. It is not only the holy place for Christian couples to hold their wedding, but also a great venue for non-religious grooms and brides to take nice wedding shots. The construction of Hanoi Railway Station was completed in 1900. It was the largest railway station in Indochina at that time. 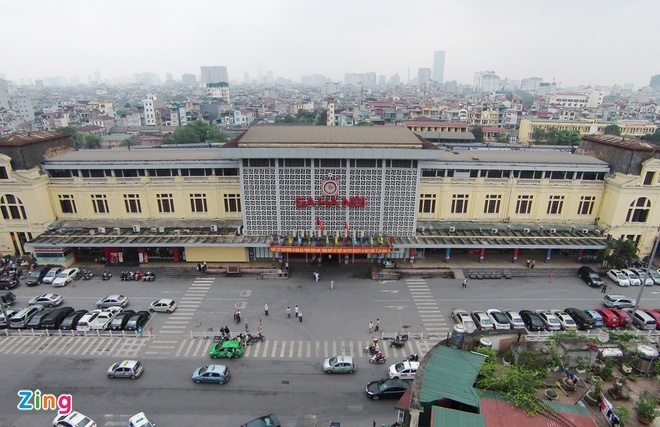 Today, it is still the major railway station in Hanoi and the largest railway station in Vietnam. This is a ceramic mosaic mural on the wall of the dyke system along the Red River. With a length of about 4 km, the Ceramic Road is one of the major projects developed on the occasion of Hanoi’s Millennial Anniversary. The Hanoi Ceramic Road originated with journalist Nguyen Thu Thuy, who won a prize in the Hanoi architecture contest for her idea of transforming the dyke system around Hanoi into a ceramic mosaic. She was supported by the Ford Foundation which funded the first 500 meters of the wall, and the planning, training, and infrastructure needed to complete the project. The work of decoration began in 2007 and finished in 2010 to commemorate the Millennial Anniversary of Hanoi in October 2010. The work runs along the road of Au Co, Nghi Tam, Yen Phu, Tran Nhat Duat, Tran Quang Khai, and Tran Khanh Du and terminates at the pier of the Long Bien Bridge. Participating in the work of decoration were not only Vietnamese artists but also foreign embassies and culturalcenters in Hanoi such as the Goethe-Institut, L'espace, British Council, Dalte Centre and other cultural centers from Russia and South Korea. The mosaic wall is made from ceramic tesserae which are products of the ancient pottery making village of Bat Trang, in Hanoi’s suburbs. The content of the mosaic represents decorative patterne from different periods in the history of Vietnam: Phung Nguyen culture; Dong Son culture; Ly Dynasty; Tran Dynasty; Le Dynasty and Nguyen Dynasty. Also incorporated on the wall are modern art works, paintings of Hanoi and children's drawings. Phu Tay Ho (Tay Ho Temple) is located on a peninsula in the middle of West Lake shore in Hanoi. It is a popular destination, especially on the first and 15th of each lunar month when many pilgrims come to pray and show their worship. The temple was said to be built in the 17th century, maybe later. Phu Tay Ho is dedicated to the Mother Goddess Lieu Hanh, one of the Four Immortals in Vietnamese mythology. Visitors come here not only for worshipping but also relaxing and enjoying the fresh atmosphere and landscape in the middle of a bustling Hanoi. Do not miss open-air shops, just beyond the temple’s entrance, there are delicious dishes like bun oc (snails and rice vermicelli soup), oc xao chuoi dau (starchy green bananas with tofu, scallions and herbs). Banh tom (crisp shrimp) is available throughout the country but it is best to have it at West Lake, around Phu Tay Ho temple. Phu Tay Ho temple festivalis held annually from the 3rd to 7th day of the third lunar month attracting thousands of people for worship and many traditional activities like writing prose contest, chầu văn singing, musical instrument playing, and singing. 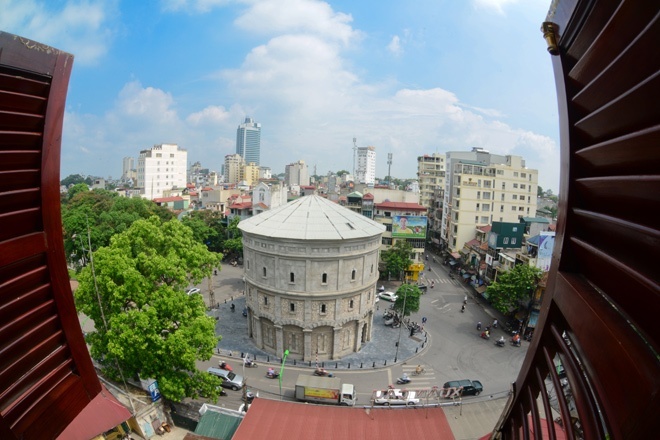 This water tower was built in 1894, before Long Bien Bridge, and is located at the crossroads of Hang Than, Hang Luoc, Hang Giay, Hang Dau, Quan Thanh and Phan Dinh Phung streets. This water tower was the first work marking the transformation of Hanoi into an urban center. Previously, Hanoians used well water or water from lakes and ponds. This water tower has become a special landmark in Hanoi, just like Hoan Kiem Lake or the Old Quarter. During the wars, the tower was not hit, but in the 1960s, it stopped working. For years, the tower was surrounded by many stalls, but in 2003, these stalls were closed. The ancient water tower stood in its original form until early April 2010, when the tower was refurbished. The statue is located in Chi Linh Park, Hoan Kiem District. The statue was opened in October 7, 2004 and looks toward the Hoan Kiem Lake. It was created by Vi Thi Hoa, and was cast in pure copper. Ly Thai To (974-1028) was the founder and first emperor of the Ly Dynasty (1009-1225). After ascending the throne, he moved the capital to Dai La (which he renamed as Thang Long) in 1010, which in the end became present day Ha Noi. The bridge was initially called the Doumer Bridge. At the time of construction, the more than 2km-long bridge was one of the world's largest bridges, and one of the most important works of the Far East. For over 100 years, the bridge has seen many changes since the country's wartime to peacetime, and has become a symbol of the history of Vietnam. The National Museum of Vietnam History was founded on the material basis of the Louis Finot, a museum of the Ecole Française d’Extreme-Orient (French School of the Far East) which was built in 1926 and completed in 1932. In 1958, the Vietnam Government officially took over this cultural building and started to research, collect and supplement materials and objects, converting the contents from eastern arts into national history. On 3 September 1958, the National Museum of Vietnam History was officially opened for visitors. The basic storehouses now keep more than 100,000 specimens and artifacts of different materials, including many rare and valuable items, especially the collections of objects dating back the ancient cultures (Hoa Binh-Bac Son, Dong Son), Vietnamese ancient glazed ceramics, Champa stone sculptures, and bronze items under the Le-Nguyen Dynasties. The museum is situated at the back of the Hanoi Opera House. It is in 1 Trang Tien Street, 216 Tran Quang Khai Street, Hanoi. Ham Long is a Roman Catholic church in the centre district Hoan Kiem of Hanoi, Vietnam. The church was built at the end of the 19th century near an old street named Ham Long from which Ham Long church was called. The church was designed and completed by a Vietnamese architect, with the height of 17 meters. It was built with traditional materials such as lime, bamboo and cardboard...to create arches and make echo effects when celebrating the Mass. The columns and altars are decorated with rope motifs like those on the tunic of the Francis order. The church’s patron saint is St. Anthony of Padua. Ham Long Church with two street frontage overlooking Ham Long and Ngo Thi Nham street is considered one of the most beautiful churches in Hanoi. Today, Ham Long Church is one of the three major churches of Hanoi, together with Cua Bac Catholich Church and Hanoi Cathedral Church. The Dong Xuan market, built in 1889 by the French, is the largest in Hanoi market covered and one of the most popular and crowded city markets. Dong Xuan Market has been renovated several times with the latest in 1994 after a fire which almost destroyed the market. Nowadays, Dong Xuan Market is the largest covered market of Hanoi where the wholesale traders sell everything from clothes, household goods to foodstuffs. The popularity of Dong Xuan market is not so much by the variety of products nor by its price, but also because it is located in the Centre of Hanoi, just 5 minutes walk from the central lake in Hanoi, Hoan Kiem Lake. The market is housed within a four-storey building on the northern edge of Hanoi Old Quarter. It’s also known as Hanoi’s largest indoor market, offering a wide range of goods such as fresh produce, souvenirs, accessories and clothing, as well as electronic and household appliances. There’s also a massive dining area within Dong Xuan Market, with food vendors selling Vietnamese coffee and exotic local dishes. Surrounding Dong Xuan Market are many more shops where you can purchase traditional Dong Ho drawings, Bat Trang ceramics, Binh Da embroideries and laces, and sand paintings. Inaugurated in 1985, the Cultural Friendship palace is a prestigious cultural center in Vietnam. It was gifted by the USSR Central Trade Union Council to the Vietnam Trade Union and it stands today as one of the biggest cultural centers in Hanoi. Covering around 3.2 hectares, the center has 3 major buildings that comprise a study house, science & technology house and a performance house. The Cultural Friendship Palace is the hub of all art shows, beauty contests, cultural activities, workshops, exhibitions, sport events and conferences. Since its set up, the Palace has been a landmark for conducting many notable events and functions of Hanoi and is a striking building that is well furnished with state-of-the-art facilities. The tower was built in 1812 during the Nguyen dynasty as an observation post to the Hanoi Citadel. Unlike many other structures in Hanoi, it was not destroyed during the French invasion (1896-1897), and was used as a military post. It is now located in the Vietnam Military History Museum. The flag tower is composed of three tiers and a pyramid-shaped tower with a spiral staircase leading to the top inside it. The first tier is 42.5 m wide and 3.1 m high; the second - 25 m wide and 3.7 m high and the third - 12.8 m wide and 5.1 m high. The second tier has four doors. The words "Nghênh Húc" (To welcome dawn's sunlight) are inscribed on the eastern door; the words "Hồi Quang" (To reflect light) - on the western door and "Hướng Minh" (Directed to the sunlight) - on the southern door. Hoan Kiem Lake (Sword Lake) is one of the major scenic spots in Hanoi and serves as a focal point for its public life. According to the legend, in early 1428, Emperor Le Loi was boating on the lake when a Golden Turtle God (Kim Qui) surfaced and asked for his magic sword, Heaven's Will. Le Loi concluded that Kim Qui had come to reclaim the sword that its master, a local God, the Dragon King (Long Vuong) had given him some time earlier, during his revolt against the Ming invaders. Later, Le Loi gave the sword back to the turtle after he finished fighting off the foreign invaders. Le Loi renamed the lake to commemorate this event, from its former name Luc Thuy meaning "Green Water". The Turtle Tower (Thap Rya) standing on a small island near the centre of lake is linked to the legend. Large soft-shell turtles, either of the species Rafetus swinhoei or a separate species named Rafetus leloii in honor of the emperor, had been sighted in the lake for many years. The last known individual was found dead on January 19, 2016. Near the northern shore of the lake lies Jade Island on which the Temple of the Jade Mountain (Ngoc Son Temple) stands. The temple was erected in the 18th century. It honors the 13th-century military leader Tran Hung Dao who distinguished himself in the fight against the Yuan Dynasty, as well as Van Xuong, a scholar, and Nguyen Van Sieu, a Confucian master and famous writer in charge of repairs made to the temple in 1864. Jade Island is connected to the shore by the wooden red-painted The Huc Bridge (The Huc, meaning Morning Sunlight Bridge).